WITH Timmy Trumpet, le Shuuk, Alle Farben and LOVRA! 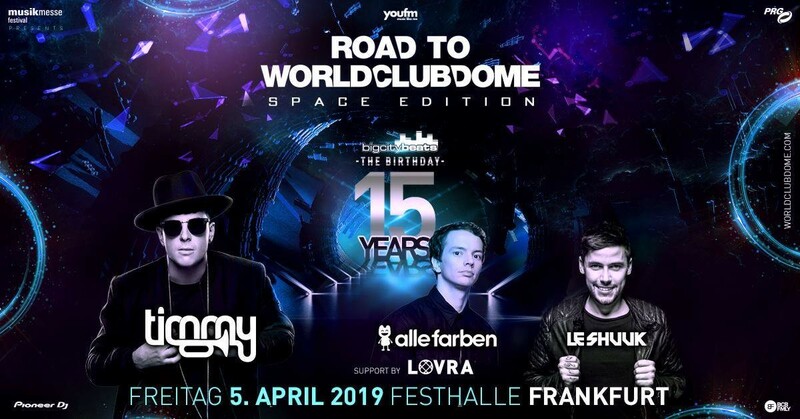 PRE-REGISTER now for the biggest Road To WORLD CLUB DOME Party EVER - and be the first one to find out about the crazy LINE UP! BigCityBeats - the sound of the big cities. The metropolises. BigCityBeats brought this idea to life, and since 2004 it catapulted into a platform that redefines event productions. From the big city into the world. From Frankfurt to Asia, Europe, to the seas, the rails, the air, and almost to space, to zero gravity with the ESA.